We take care of all the hassles and waiting for rebates. You can just sit back and enjoy your new COMFORT system. Save! When You Replace Your Residential Cooling & Heating System. Your new system will actually end up paying for itself! SAVE $ from 30% to 40% on your cost of electric bill. The amount you’ll save depends on how inefficient your old system was compared to the efficiency of the new installation. We Make It simple. 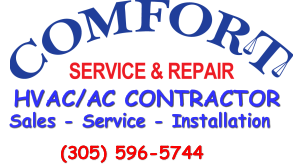 One of the benifits of working with COMFORT SERVICE AND REPAIR, is that our Comfort Advisor can come to your home, determine exactly what rebates, credits and discounts your system is eligible for and then submit the paper work for you. We take care of all the hassles involved with filling out rebate forms and you can just sit back and, enjoy your new comfort system. You’ll get your FPL discount directly from us (Comfort Service and Repair).